In our shop, you will find both a mechanical and digital paper scale for professional weighing of sheets of paper in g/m² (in relation to a square meter of paper). Two kinds of paper scale are available: The mechanical paper scale with weight range up to 900 g/m², and the digital paper scale with display to show the weight of the surface of paper in g/m² or in g.
Our mechanical paper scale will determine the weight of paper, cartons and boxes in a fast and efficient way. 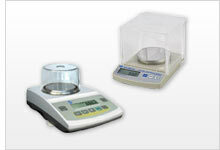 Alternatively, our digital paper scale can be used for all kinds of laboratory tasks. For instance, you can weigh papers, floor-tiles or fabrics in relation to a square meter of material. The paper scale is delivered with two patterns (to measure thin sheets of paper accurately). The Paper Scales can now be purchased directly in our shop / order or take advice from our technicians at or Phone: +44 (0) 2380 987 035 for PCE Instruments UK or or Phone: +1 (561) 320-9162 for PCE Americas Inc..
PCE-DMS 200 is a GSM paper basis weight scale used to accurately determine the basis weight (in relation to a square meter of material) of paper, cardboard, fabric, textiles and more directly in g, g/m², oz or oz/yd². The basis weight Paper Scale directly shows the result in g/m² with high resolution (0.1 g/m²) / the weighing unit can be changed to grams by pushing one button only. Paper Scale Sample Cutter 3mm / 0.12"
This round sample cutter features four internal blades for quick, easy and clean cutting of paper, leather, cotton, textiles, cork and more by hand. - Maximum sample thickness: 3 mm / 0.12"